Promotional Table is one of the best display for Outdoor Solutions. 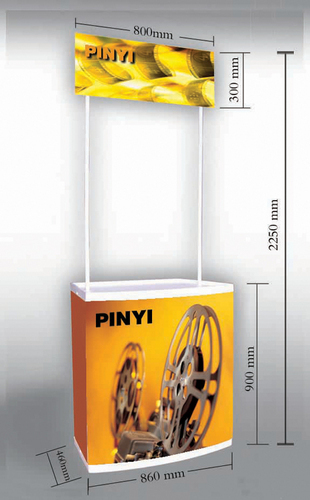 The material for Promotion Table is ABS(PVC) which is of very good quality, foldable and easy to carry. It will be in great quality if printing done in Eco Solvent printing. Top - 12 " x 32"
Bottom Middle - 32" x 32"
Left & Right - 16" x 32"
Want to survive in this highly competitive business world, do promote your business in an unique way with us. With over many years of experience in the industry, we have been serving our customers a wide range of quality display stands which is the most effective and prominent way to make our business grow in the fastest and unique techniques. Our customers appreciate the quality and performance of our products, which makes them one of the most value-adding and cost-effective solutions available in the market today. Our wide range includes various kinds of Display Stands which are easy to carry, user friendly, highly compatible and easily foldable and also we are one of the biggest stockist of Aluminium Composite Panels (ACP Sheets) which is used for Sign Boards, Interior Designing and Glazing and Cladding work on major IT Parks, Hospitals, Shopping Malls, etc. These products are procured from registered and experienced vendors. Manufactured using latest technologies and best quality raw-material, the products offered by us are an ideal combination of innovative designing techniques and advanced production technologies. With a well established network of distribution and service agents, we have been able to reach every corner of the country. Owing to our strong business ethics and transparent policies, we have been able to gain the trust of a large number of customers across the nation. We have been able to maintain an unblemished track record of timely execution of all orders. This has enabled us to have long-term, mutually beneficial relations with various reputed domestic organizations and MNCs.